In support of the CPTPP agreement launch, Canada Beef partnered with several other Canadian beef organizations and companies at the Canadian Beef Embassy to showcase the best of Canadian beef. Chef Mathieu Pare of the Canadian Beef Centre of Excellence demonstrated Canadian beef cuts and techniques focusing on 3 packer promoted cuts – the chuck roll, striploin and outside skirt steak. 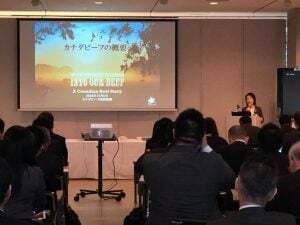 Yuko Onizawa of Canada Beef (Japan office) conducted a seminar on the Canadian Beef Advantage. Through the presentations, demonstrations and seminar the audience developed a greater understanding of how Canadian beef if raised, our world-class standards and how the land shapes the taste of Canadian beef. 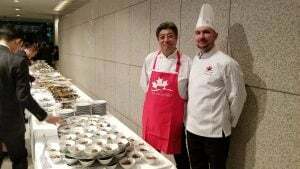 Following the formal presentations there was a full service buffet highlighting both Canadian Beef and Veal recipes. The attendees greatly appreciated the opportunity to taste delicious Canadian beef. Click the images below to see more pictures from Tokyo.